The Greek meze or mezes,mezedakia are the “tapas” of Greece. Most usually you will order them with Ouzo or Retsina wine. In generally the Greeks will order meze or mezedes in a restaurant as appetizers. The most famous mezes in Greece is the Grilled Octopus,but there are many other mezes you can find in different areas of Greece. In many Greek restaurants introduce a tray of mezedes in small plates so you can choose what to order. Some of the most common are Tzatziki Ttaramosalata, Green peppers ,Olives, Tyropitakia (small cheese pies),Spanakopitakia (small Spinach pies) ,Kolokythopitakia (pumpkin pies) ,Htapodi Xidato (Octopus boiled in vinegar with Greek Olive Oil ), Soupies Krasates (Cuttlefish cooked with wine) , fried Kalamarakia (Squids) ,fried Shrimps and many kinds of Greek sausages (Loukanika horiatika).Crete is the paradise of mezedes that are served with the local drink Raki or Tsikoudia , made from grapes. If you are in Crete in the Spring the best mezedes are also very simple, all you need is a small bottle of tsikoudia with fresh broad beans ,potatoes grilled on the coal and the local cheese Anthotyro or Mytzithra. In most Greek traditional Kafenia (coffee shops) the ouzo served with a small plate of tomatoes ,cucumbers cheese ,anchovies and a few olives. 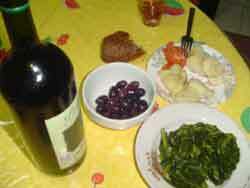 Another famous mezes is Spetsofai (fried sausages with green peppers) and Bekri Mezes (the drinkers meze) . Wash the meat and cut it into large cubes. Heat the butter and brown the onion. Add the meat and spices and continue cooking. Add the wine, and then the tomato paste, the tomatoes and the parsley. cover and simmer for about 1 1/2 hours. Note: if the sauce is too thin, add a litte flour mixed with wine.